There are two ways to remove the corn from the cob. 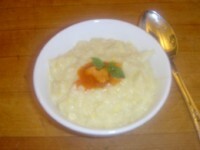 Both are used in this recipe. The corn is just heated through and served with a tiny dollop of Pimenton butter — so good! If it looks like too much work, you can order it at COCO 500, the new hot restaurant at the corner of Fourth and Brannan Streets. Click here to learn more about COCO 500. 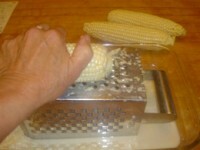 After removing the husks from the corn, scrape 5 of the ears of corn over the large holes of a box grater laid on its side in a baking pan, turning the corn to get all the kernels off. Discard the cobs. 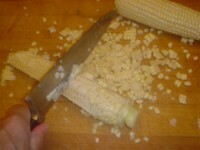 Set the remaining corn on end and cut off the outer kernels all the way around; scrape the back of the knife up and down the last cob to get out more juice. 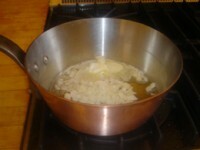 Cook the onion and fennel gently in the butter with a sprinkling of salt. 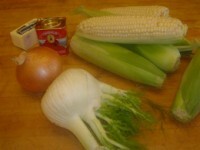 Add all the corn and heat gently, stirring with a wooden spoon. Add salt to taste. It does not need to cook more than a minute. Note: The remaining pimenton butter can be shaped into a long form and wrapped in plastic wrap for storage in the freezer or fridge. 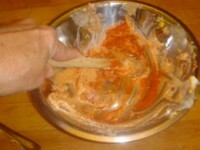 It would taste delicious on a piece of grilled fish, chicken, or lamb. Always put it on very hot food so that it melts.